This is one of the reasons why you have heard little from the banks or the government about the compensation available. 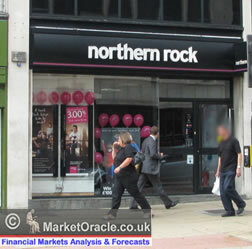 As it has been a significant factor in people withdrawing funds given that the risk for what were previously deemed as being risk free savings accounts with Northern Rock was too great. The current compensation limit is 100% of £2000 and 90% of the next £33,000. Thus providing maximum compensation of £31,700 on savings of £35,000. The following table illustrates the risks that savers face and why the run on the Northern Rock bank has occurred. As an example, someone with £50,000 in Savings would be risking a loss of 36.6% for a potential return of just 6.5% or less! Under such circumstances a panic withdrawal is virtually guaranteed, regardless of the reassuring utterances from Gordon Brown's Darling. It is the Governments and Bank of England's job to ensure financial stability in the banking sector, clearly the current compensation limits are inadequate to assure such stability should any bank get into difficulties. The government needs to urgently investigate raising the compensation limits on savings to a point which will stop the current and future panics. To ensure stability the government should at least ensure that the first £100k of savings are 100% secure. The next £100k secure at 95%. If such a scheme was in place than the run on Northern Bank that continues even today would not have occurred ! As the vast majority of savers would have no reason to panic. Additionally the banks could advertise the fact that their savings are secure to the above limits, instead of keeping quiet on the current compensation limits are obviously are too inadequate and contributing to the ongoing panic.